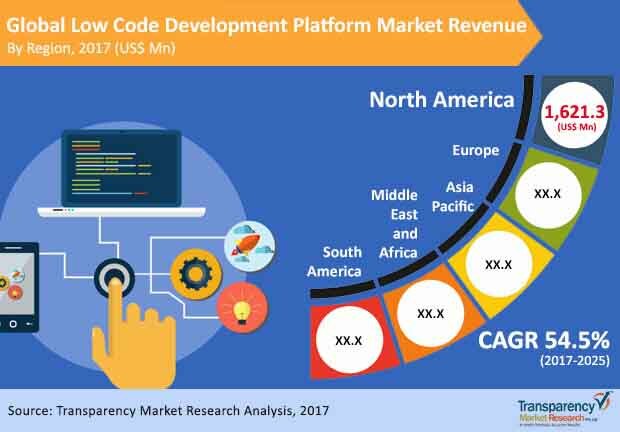 The global market for low code development platform is highly fragmented and is expected to showcase thriving growth in the forecast period. Some of the prominent market players such as Microsoft, Salesforce, and Google are expected to work on the creation and development of apps based on cloud services. Also, these players are anticipated to focus on customer requirements and accordingly provide services embedded in the apps. Adding to this, the rising need for automation and creative applications have compelled the software developers to build apps in large volume. Some of the key players operating in the global low code development platform market include Bizagi Appian Corp., Caspio, MatsSoft Inc., AgilePoint, Mendix, and OutSystems. The market for low code development platform was valued at US$1647 mn in the year 2015. It is estimated to reach at a CAGR at 54.5% during the forecast period 2017-2025. The global market is segmented as per type and deployment type. According to type, the general purpose platform and mobile-first app platform are estimated to drive the demand for low code development platform market from 2017-2025. As per deployment type, the low code development platform market is divided into cloud-based and on-premise segments. In the cloud-based segment, hybrid cloud is likely to surge the market growth globally. As per regions, North America accounted for 40% market share in the year 2016. Rising investment is offering huge growth opportunities in Europe. Also, the market in Europe is expected to increase owing to the rising customer application demand. The demand for low code development market is increasing in countries such as India, Japan, and China which results into offering immense growth opportunities in Asia Pacific region. Organizations across the world are adopting the low code development platforms as the platform allows the business to integrate with the IT infrastructure, thus increasing the adoption of technological changes. Companies without making huge investments in hiring developers can accomplish application development by using the low code development platform. Hence, these platforms are picking up steam which leads to the growth of this market globally. Customer-focused applications and web development are forcing many companies to implement the low code development platform solutions. This platform can build more online apps in lesser time, which ultimately results in cost reduction. In addition to this, the software developers with the help of low code development platform can deploy applications without much effort. At the same time, it also offers training and development which makes it easy for developers to overcome the initial challenges they face. Some of the challenges such as customization and platform-related shortcomings are expected to hinder the growth of low code development platform market in the forecast period. The toolkits available in the market are not sufficient enough to analyze and resolve the customization issues in apps. This challenge is likely to hamper the market growth for low code development platforms. Having said that, many recent developments in information technologies are going to offer growth opportunities during the forecast period.